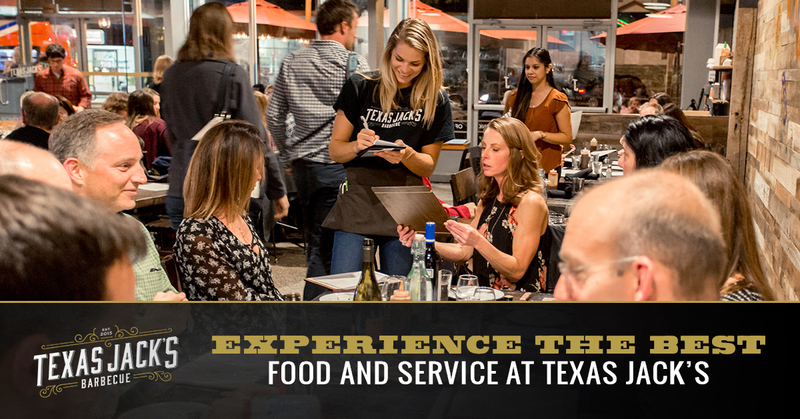 At Texas Jack’s, we place as much emphasis on providing our customers with the highest-quality customer service as we do on creating the most delicious food. Although our food is just as delicious as the fare from nearby upscale restaurants, our barbecue restaurant in Arlington features a distinctly casual atmosphere. In order to enjoy your overall experience as much as possible, you don’t need to dress up or feel shamed by pretentious servers. As soon as you walk through our doors, our friendly staff will greet you with a smile and make you feel right at home. Today, we would like to highlight some unique aspects of our restaurant. Did you know that you can rent out our space for events such as receptions or company parties? We are happy to rent our our main dining room, private dining room, or bar for your special event. Accommodating 100 guests, our main dining room includes a direct view of our open kitchen. All the tables and chairs are handmade from local sources of locally reclaimed wood. If you are planning a sizeable event, this space could be perfect for your party. If traditional weddings hold no appeal to you whatsoever, why not get married at our barbecue restaurant instead? It would be way more fun and way less fussy, and you’ll be able to freely indulge in your favorite food! With a capacity of 50 guests, this dining room works better for smaller parties. If you are a football fan, you could consider renting out this room to watch a big game with your buddies. Equipped with its own bar, two flat screen TVs, and sound controls, you’ll host the football party of your dreams here. We can accommodate the seating arrangements for sit-down dinners, cocktails and h’orderves, or buffet-style dining. If you desire a more casual atmosphere, you could consider renting out our gorgeous reclaimed wood bar. Abundant in local craft beers, this bar also includes an entire wall dedicated to our collection of fine bourbons and ryes. For wine lovers, we offer a wine tap and our bar also provides an excellent selection of smoked cocktails unlike any drink you’ve ever tasted. During the week, we serve lunch, dinner, and Happy Hour fare for our beloved guests. Whether you arrive at our establishment starving or desire a lighter meal, you will leave satisfied. If you aren’t too hungry, you could nosh on our appetizers, such as our Kale Caesar Salad. Featuring a dusting of parmigiano reggiano cheese, this salad includes fried capers and fresh Tuscan kale for a healthy and delicious treat. If you are a fan of both hearty barbecue and delicious brunch fare, you may look forward to our Barbecue Brunch menu all week long. Served on Saturdays and Sundays from 9:30 am to 2:30 pm, our brunch menu combines classic breakfast cuisine with hearty smoked meats and features a variety of daytime cocktails. If you haven’t visited our family style restaurant in Arlington, we invite you to join us for the best barbecue in the Washington DC area. Not only will the food taste out of this world, but you’ll have a blast hanging out in our laid-back establishment. Stop by Texas Jack’s today!